The Great Barrier Reef (GBR) region with its two layers of protected areas (the GBR Marine Park and the GBR World Heritage Area) is a large marine ecosystem adjacent to the north-east Australian coast. 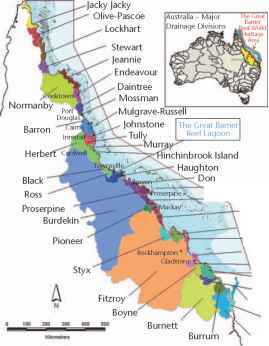 The land adjacent to the GBR forms the GBR Catchment Area (GBRCA) (Fig. 11.1) from which many rivers and streams discharge into the GBR. As the GBRCA has been developed for agricultural, industrial and residential use over the last 150 years, waters discharged from GBRCA rivers have contained increasing amounts of nutrients, sediments and other pollutants. use; and a diverse array of other pollutants (e.g. heavy metals, persistent organic pollutants, antibiotics, and caffeine) and nutrients from urban land use associated with sewage effluents and stormwater runoff. Pollutants are transported through GBRCA rivers primarily in large flow events following monsoonal/ cyclonic rainfall. As the rivers flood, a proportion of the pollutant load is trapped on floodplains, especially in riparian vegetation and wetlands. However, since GBRCA rivers are relatively short and fast flowing there is limited time for trapping and most rivers discharge a high proportion of their fine particulate and dissolved pollutant load to the ocean (Fig. 11.2). Most (80% south of Cooktown) lower river floodplains in the GBRCA have been drained and converted to agricultural and urban uses, further reducing their ability to trap catchment pollutants. expose large areas of the GBR lagoon and the embedded ecosystems to terrestrial pollutants. The extent of exposure of inshore ecosystems, such as coral reefs and seagrass beds, to the various land-sourced pollutants has been estimated through modelling and monitoring. 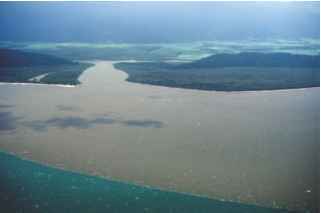 Figure 11.3 Phytoplankton bloom and flood plume from the Mackay/Whitsunday region rivers, January, 2005. 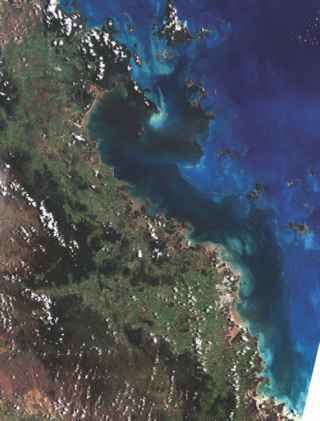 Satellite image from the Landsat sensor processed by Department of Natural Resources and Water, Queensland Government. 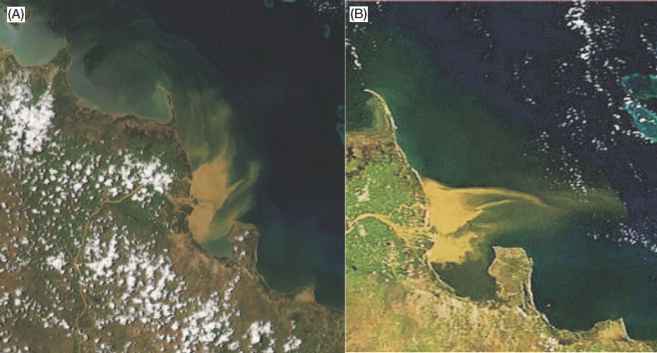 Figure 11.4 A, Flood plumes from the Burdekin River on 28th January, 2005 and B, 29th January, 2005 showing the area of intense deposition of suspended sediments near the river mouth. Satellite images from the MODIS sensor processed by Arnold Dekker and colleagues of CSIRO Land and Water, Canberra. further research. A brief overview over these five types of water quality issues is given here. Both suspended sediments and phytoplankton blooms can reduce light to benthic organisms via increased turbidity. Light limitation from turbidity reduces gross photosynthesis and growth at deeper depths but not in shallow water in hermatypic corals, seagrass and macroalgae. Light limitation also greatly reduces coral recruitment. The extent of trophic plasticity varies between coral species and effects of light limitation are most severe for more phototrophic species, and less influential on trophically more plastic groups. Heterotrophic species such as filter feeders may be promoted at low light. Enrichment with POM enhances feeding rates and growth in some corals, providing a growth advantage that can partly or fully compensate for light reduction, especially in high-flow environments. However, while some corals can benefit from POM, heterotrophic filter feeders will benefit even more than corals do, hence the competitive advantage shifts from corals that can grow at extremely low food concentrations to simpler, more heterotrophic communities. Dissolved inorganic nutrients can reduce coral calcification and increase macroalgal abundances. Excessive nutrients may shift coral communities towards algal dominated communities, although this shift is complicated by the abundance of algal grazing fish. Where grazing fish (and other invertebrate grazers) are abundant they may control algal proliferation and thus reduce the manifestation of undesirable effects of nutrient enrichment. Dissolved inorganic nutrients are generally quickly removed from the water column through biological uptake. It is therefore suspected that their main role in affecting ecosystems is that of promoting the organic enrichment of benthos, sediments and suspended particulate organic matter. A more indirect effect of increased nutrients on coral reef ecosystems may arise through an increased probability of the formation of population outbreaks of the crown-of-thorns starfish (Acanthaster planci), a major coral predator. Acanthaster planci outbreaks have been a principal cause of coral mortality on the GBR (and throughout the Indo-Pacific coral province) over the last 40 years. Its planktonic larvae feed on large phytoplank-ton, and experiments suggest that the successful development of these planktonic larvae is food limited: their survivorship increases steeply with increasing availability of suitable food. Observations suggest that the location and timing of high nutrient concentrations in the many Indo-Pacific locations correlate well with the location and times of primary outbreaks of A. planci. In the GBR, mean summer chlorophyll concentrations in the central and southern GBR lagoon are about twice as high as in the far northern part of the GBR, and can be elevated during large flood events. If experimental findings and observations also apply to the GBR, it is likely that increased survivorship of A. planci larvae and subsequent adult population outbreaks may be best explained by increased larval survival facilitated by the terrestrial runoff of nutrients and sediments. Sedimentation represents a severe disturbance for coral reefs. Sediments can smother corals and other reef organisms. Sedimentation reduces growth and survival in a wide range of coral species, although responses differ substantially between species and also between different sediment types. Coral skeletal records can incorporate trace elements that serve as proxy for sedimentation rates. These records suggest that the amount of soil washed off the land has increased about 5-fold since European settlement, and that inshore corals are exposed to (and incorporate) some of this runoff associated material. Furthermore, sediments that are enriched with nutrients are more effective than clean inorganic carbonate sediment in smothering corals, either through the formation of muddy marine snow or anoxia. Sedimentation also greatly limits recruitment and the survival of early life stages in corals: settlement rates are near-zero on sediment-covered surfaces, and sedimentation tolerance in coral recruits is at least one order of magnitude lower than for adult corals. Some of the bioeroding and space-competing groups of organisms are also sensitive to sedimentation by fine silt, and so are crustose coralline algae, with negative consequences for coral recruitment. Herbicide residues (especially diuron, atrazine, si-mazine, ametryn, hexazinone and tebuthiuron) are commonly being detected in river water in high flow conditions and in river flood plumes. More sensitive monitoring tools are now deployed in the GBR Lagoon, where residues of some pesticides are also being detected, presently in quite low concentrations, during non-flood (dry season) periods. Herbicide residues (e.g. diuron) can disrupt photosynthetic activity in marine plants including mangroves, seagrasses, coral zooxanthellae and crustose coralline algae. In addition, pesticide residues of various commonly used and detected types (herbicides, insecticides, fungicides) can directly affect the physiology of coral, especially at the reproductive, larval and juvenile stages. The type and severity of response to terrestrial runoff at any particular location depends on whether changes occurred predominantly in sedimentation, turbidity, POM, dissolved inorganic nutrients or pesticides. The severity of response also depends on the physical, hydrodynamic, spatial and biological properties of a location. Reefs that are surrounded by a shallow sea floor, reefs in poorly flushed bays or lagoons, deeper reef slopes, and frequently disturbed reefs are likely to experience changes even at low levels of pollution, in particular when populations of herbivores are low. In contrast, well-flushed shallow reef crests surrounded by deep sea floors or in areas of moderate tides are likely to have the highest level of resistance and resilience, especially when inhabited by healthy populations of herbivores that protect against overgrowth by sediment-trapping macroalgae. In most places, reduced recruitment success in corals, together with the promotion of macroalgae and A. planci, arguably represent the most significant direct effect of terrestrial runoff on coral reefs. 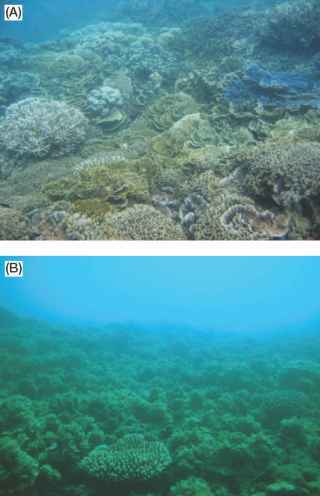 In severe conditions, the overall outcome is reduced reef calcification, shallower photosynthetic compensation points (see Chapter 7), changed coral community structure, and greatly reduced species richness. Hence, reef ecosystems increasingly simplify with increasing exposure to terrestrial runoff, compromising their ability to maintain essential ecosystem functions and to recover from disturbances, including the presently increasing level of human-induced disturbances. It can be concluded that increased pollutant discharge to the GBR resulting from agricultural and urban development on the GBRCA has degraded mangrove ecosystems in selected locations (e.g. the Mackay area) and some reef ecosystems in the inshore areas of the Wet Tropics and the Whitsundays coastal waters are also in a disturbed state, with about 50% lower coral diversity than expected, and are apparently slow to recover from disturbance. In addition, the increased frequency of outbreaks of A. planci has degraded inshore and offshore reefs along the entire central and southern section of the GBR. 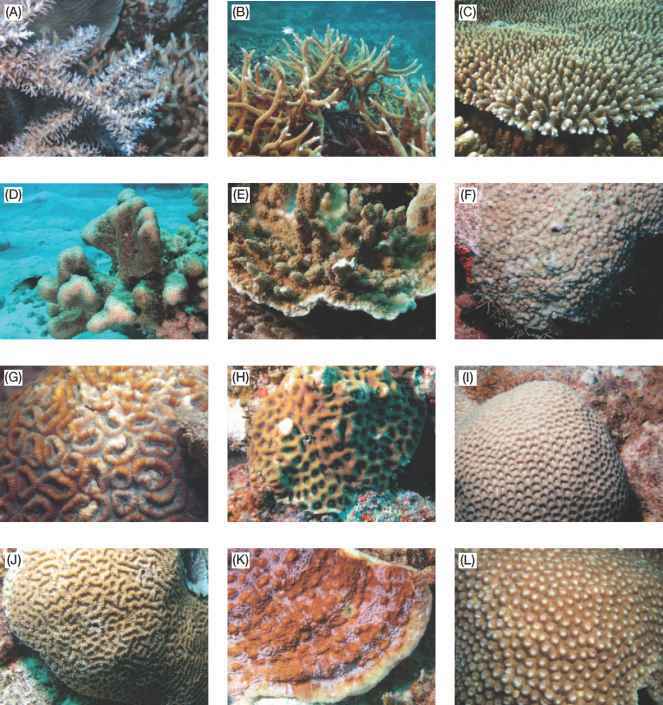 The high coral diversity and recruitment potential of inner-shelf reefs in the remote and relatively unpolluted region north of Princess Charlotte Bay is in stark contrast to the state of most inner-shelf reefs in the region of the GBR coast between Townsville and Port Douglas that has been exposed to agricultural and urban runoff (Fig. 11.5). Management regimes to halt or reverse the decline of water quality entering into the GBR Lagoon and its ecosystems are being designed and implemented. Preliminary water quality guidelines and targets for protection of the GBR have been set. Best management practices for agricultural and urban activities have been tested for their effectiveness in improving water quality. Modelling has been used to predict the effectiveness of land management at a catchment scale on reducing pollutant loads. A management response has also been developed by the Australian and Queensland Governments through the GBR Water Quality Action Plan in 2001 followed by the GBR Reef Water Quality Protection Plan (RWQPP) in 2003. The RWQPP is now being implemented through regional natural resource management plans and the proposed regional Water Quality Improvement Plans. For the better management of fertiliser use, Nutrient Management Zones are being designated based on their estimated risk to the GBR such that management can be targeted within high source areas. will be integrated through a set of catchment to reef models. However, terrestrial pollution is not the only stress facing the ecosystems of the GBR, and it is the combination of multiple stresses (from global climate change, fishing and pollution principally) that will escalate threats to the long term viability of the system. Management of water quality issues alone, no matter how effective, are unlikely to prevent further degradation of the GBRWHA without concurrent management of fishing impacts and climate change.